Namco's Wangan Midnight Maximum Tune 4 Arcade Machine is being released as a "rental" machine where owners need to pay an initial setup cost, then pay a percentage of the income to Namco. The factory mentioned they are not going to sell the machines outright but work on profit sharing with the owners on contract basis. Namco's idea is for owners to sign contracts with the manufacturer (lease terms to be negotiated) and cost per game will be fixed in each country. For example, if the price per play in Australia is $2 per game, it will be fixed at $2 per game for all machines in Australia. The releasing date is approximately November for Hong Kong market and then later for other regions in Asia. 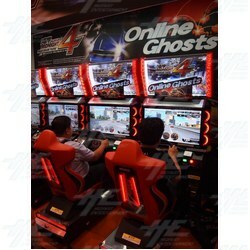 Package is 4 seats with one terminal and special router is needed - the game must be operated online. The new version will adopt Banapassport card for storing game data. Players can transfer their 3DX+ data to Banapassport card by using the Terminal. The new card can store up 100 cars data. Tuning card will be done in the terminal too. Please stay in touch for more details and test results.